The home of the Bali Myna, this park also hosts a good selection of other sundaic lowland species. Bali Barat National Park lies at the western end of Bali. It is a large park, made up mostly of dry savannah-like forest, with smaller patches of denser wet forest. Most areas of the park are not particularly accessible and it used to be that to have a chance at seeing the main speciality – Bali Myna –a short boat trip was required. The captive breeding and re-introduction programme for the species has however now seen a population established along the main road where you get the boat to the more remote parts of the park (Labuhan Lalang). After that, the birding is pretty good around the periphery near the road connecting Gilimanuk to Pejarakan. Here there are several patches of nice forest that support Javan Banded Pitta, Green Junglefowl, Javan Hanging-Parrot etc. The history of the Bali Starling in Bali Barat National Park is a bit of a sorry tale. By the early 1990’s the wild population was already down to 30 or so birds and a result of sever poaching pressure, and it continued to fall until the early 2000’s. For the next few years there was little more than 2-3 pairs present in the park, but numbers have begun to rise again with a rejuvenated captive breeding and release program. These released birds have now themselves begun breeding again in natural habitat and wild-born starlings are once again present, albeit it in precariously small numbers, within the park. The original release site was well within the park, with access only via the boat trip from Labuhan Lalang. Now Bali Myna can be seen from Labuhan Lulang itself, with a number of pairs and their wild bred young present and fed by the small ranger’s station here. A new cage with captive individuals is also present here. To see some of the other goodies of the park like the very rare Black-winged Myna, a boat trip from Labuhan Lalang to areas along the north-east coast can be undertaken. Such a trip will usually take you to one of the remote jetties along the coast, and a short walk inland gets you a chance at the birds. The beaches in this area also hold Beach Thick-knee, which you have to admit is a pretty cool bird! See details below about arranging these trips. Along the eastern edge of the park are some quite good areas of wetter (denser) forest. 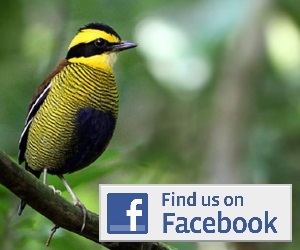 These are good places to try for Javan Banded Pitta and Green Junglefowl. Drier areas along this edge are still worth a look-in, not least for a chance at Java Sparrow that is present within the park. A number of lowland forest birds are present here, including regional endemics such as Grey-cheeked Green Pigeon, Javan Hanging Parrot, and Crescent-chested Babbler. Other species include Rufous-backed Dwarf-Kingfisher, Cerulean Kingfisher, Black-thighed Falconet, Coppersmith & Linneated Barbets. Good areas to try are around the grounds of the Menjangan Resort and along the road nearby, also the area around Tegal Bunder, where there are some park offices and quite extensive areas of wetter forest. The mangrove and mudflats around Gilimanuk Bay in the south can be quite productive for waterbirds and waders, including Javan Plover. If you are staying in Gilimanuk this just requires a short walk, or if you are staying elsewhere a drive along the road just north of Gilimanuk gets you pretty close. The barren salt pans to the east of the Menjangan Resort, west of Pemuteran, are a good site for Javan Plover and other waders in season. Access is via several of the small roads heading north from the main road between the Menjangan Resort and Pemuteran, near the ‘Mimpi Resort’. Birding along the road and Gilimanuk bay does not require any special permission, as these areas lie largely outside of the park. Birding in the grounds of the Menjangan Resort probably requires you to ask at the resort if it’s OK first (obviously if you opt to stay there, no problem). Getting into the park, or to go birding around Tegal Bunder, requires you to get permission from the park. 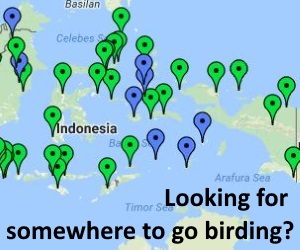 The easiest way to do this, and to arrange boat hire, is to contact one of the park staff that also works as a guide, and who is used by many visiting birders: Pak Yudi (tel: +62-816-470-6265). He speaks pretty good English and can take care of all arrangements for a fixed fee that is not unreasonable. If you decide to use him he can arrange to meet you locally, or at your hotel if it is local, and take you to the boat jetty at Labuhan Lalang and from there to the birds. He can also take you to sites for the Pitta within the park that you would otherwise need permission to get to. At time of writing, the boat hire is in the region of USD 40-50 (split by as many people as you can cram in it!). If you didn’t want to use Pak Yudi, you will still need permission from the park to enter, and would need to make a visit to the park office in Gilimanuk to arrange this (Kantor Pos Gilimanuk, Cekik 82253, Bali. Tel: +62-365-61060; Email: tnbb@telkom.net; Web: www.tnbalibarat.com). They may still direct you to Pak Yudi anyway, or assign you another guide. In any event they are likely to charge about the same amount as Pak Yudi, so maybe easier just to call him first anyway! Accommodation-wise, this is Bali, so there are many options. At the higher-end there are several resort-style hotels just outside the park in the north, including the aforementioned Menjanagan Resort and several others a little further to the east at Pemuteran. There is also a relatively newer hotel opened actually within the park – the ‘Waka Shores Resort’ – which could be a good option for birding on the doorstep. At the more economical end there are several basic hotels (not resorts) within Gilimanuk town, the most commonly used one being the ‘Hotel Sari’. These are cheap and convenient for a short stay. Alternatively you could visit the park on a long day out from a hotel in another part of Bali, but it would need an early start!! Please also check out the Sumberkima Hill retreat, located inbetween Pemunteran and the Barat Park, Comfortable villas, reasonably priced overlooking the Barat National Park with 70 km far views towards the vulcanos on Java. Birding in Bali Barat National Park and surroundings. Are you planning to do a birding tour in West Bali National Park and its surroundings even in other parts of Bali? Yes we are Birding Tours in Bali guided by Made Surya who is also the owner, will be happy to help and organize your bird trips. please leave a message to e-mail : madesuryawestbali@gmail.com for your pleasant bird trip in Bali.